← Jiang Zhi – Onward! Onward! Onward! « On the large surface of the image three geese make a nice diagonal cut from lower left to upper right. Basically a traditional pattern of painterly composition, in that case the geese are the motif of a photograph and the bigger part of their bodies is dug into the soil. The photo is, as so often in contemporary art in China, not the complete work. It rather constitutes a fragment of a complex that centres around one work/event-structure. The event was a performance by the then recently graduated artist Zheng Guogu: on a large piece of land, Zheng cleared away the vegetation and used white powder to lay-out an star-shaped pattern. 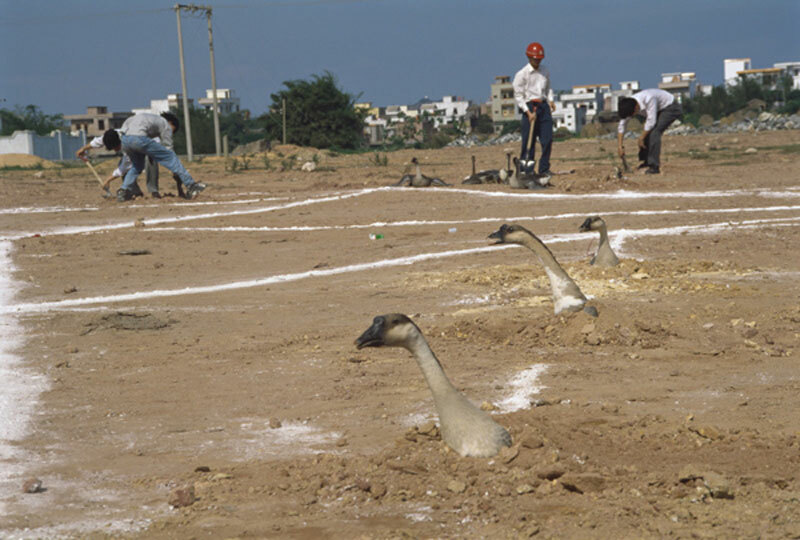 At certain points of the pattern’s outline he had small holes dug out into which he “planted” geese by digging them in up to their shoulder areas. Unlike other artistic projects of these years, the animals didn’t get killed in the process of the event. While the performance was limited in time and confined to one specific site, the photographs taken during the event are still there. The present image is one of various shots that were taken from many different angels and perspectives. Some of these are used in a more documentary fashion others are regarded as art works by themselves. So the work/event-structure of Planting Goose consists of the now gone event – including it’s preparatory materials – and the different kinds of photos that are still extant. To a certain extent even the writing about this vanished project takes part in the constitution of the work. 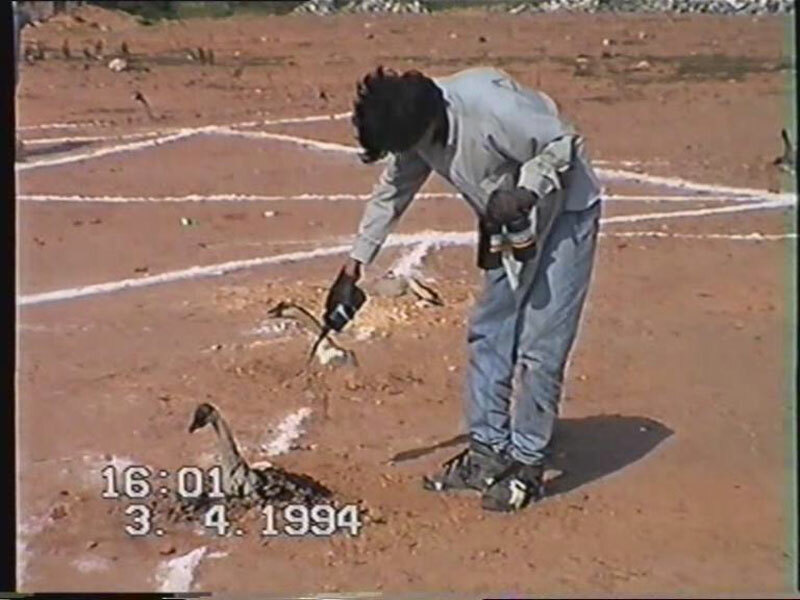 “Planting Geese, one of Zheng Guogu‘s earlist works, is both earth and performance. It serves as the annotation of the Yangjiang phenomenon. 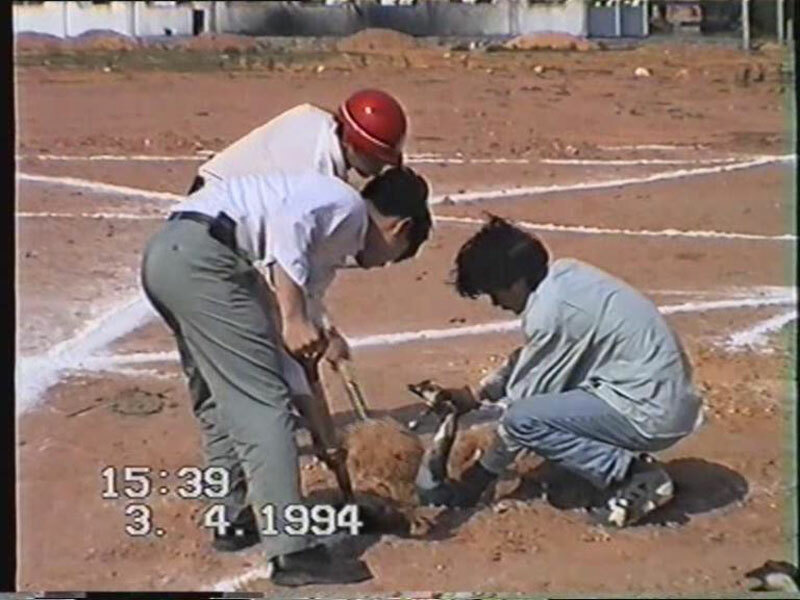 The work itself is also an example of “soft terrorism” in that the geese were not killed, but rather planted as seedlings into per-dug holes. Coated with black ink, the geese remained alive. They flapped their wings trying to fly out of the holes. This work forebodes a strategy used consistently in Zheng Guogu later works, from One Million Customers to the duplicates displayed at the Xiangning art gallery: smashing the truth with the false in the truth.